Trekking the Himalayas is as beautiful as before the earthquakes. Nepal is open for business. Foreign travellers have been coming to Nepal for five decades to trek the mountain paths that Nepalis have forged over centuries. 2015 should have been celebrated as the 50th anniversary of Nepal’s commercial trekking industry, but this milestone was overshadowed by the devastating earthquakes of spring 2015. International media coverage of the first earthquake of April 25 and the second on May 12 largely revolved around the damage done to some important heritage sites in Kathmandu. How the rest of Nepal had fared in the earthquakes — a landlocked country of almost 30 million people, spread over plains and mountains—was largely overlooked by international media. Many would-be visitors were under the impression that the whole country had been flattened and cancelled their trips to Nepal. Along with a group of other curious journalists hosted by the Adventure Travel Trade Association, I wanted to see for myself how one of the most popular trekking routes in Nepal was coping: the Everest Base Camp trek. In the Himalayas and their foothills, time is measured in days’ walk. Lukla is six days’ walk from teeming Kathmandu, over high mountain passes and milky blue glacial rivers. My group was short on time, so we flew. Thirty minutes of coasting above terraced hills, tin-roofed villages and bumpy tracks that aren’t quite roads, over land that has been traversed on foot by Nepalis for centuries. Lukla is the gateway to the Everest region, the Khumbhu, and the start of most treks to Everest Base Camp. The Tenzing-Hillary Airport in Lukla is said to be the world’s most dangerous airport: the 527 metre runway cuts straight into the side of a mountain, and veers sharply to the right shortly after touch-down. But the danger is easily forgotten with the excitement of the approach. As the 20-seat aeroplane soared closer and closer to the huts clinging onto the hills on either side, I wondered where the airstrip was until I felt the wheels touch down. But the experience felt so much like a heavily-detailed simulation that the adrenaline I felt stayed positive, not panicked. Waiting behind the flimsy wire fence separating the runway from the town were crowds of porters with their dzopa. These sturdy, pointy-horned, gentle animals are used to transport goods in the mountains of Nepal, and are commonly mistaken for yaks. They are, however, a yak-cow mix. The autumn 2015 tourism season has been bad, and the porters and dzopa hanging around far outnumbered the travellers flying in. Six months after the earthquakes, international tourist arrivals have dropped by 40 to 80%, depending on the region. Yet this lack of confidence is not based upon an accurate picture. Several districts of Nepal were badly damaged, but many more were not, or only in minor ways. 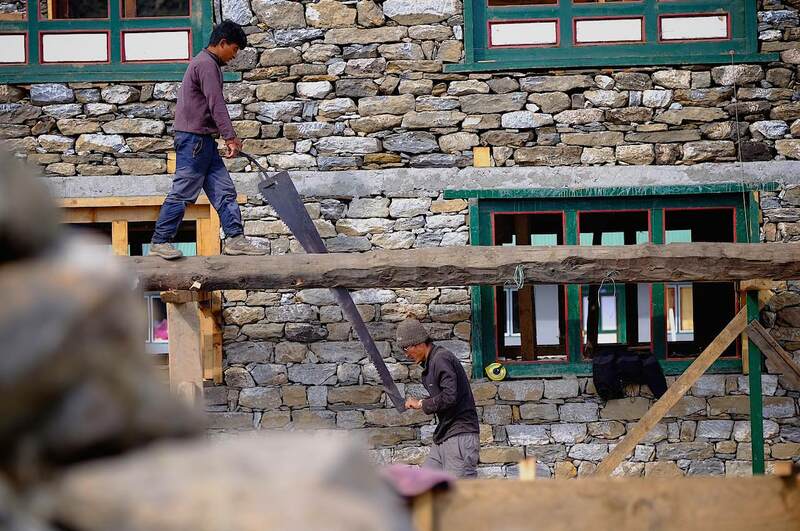 The avalanche at Everest Base Camp that killed over 20 people on April 25 was widely reported around the world, but does not reflect the condition of the trails and accommodation facilities along the entire Everest Base Camp trekking route. They are as intact, walkable and welcoming as they always were. Day one of the trek towards Everest was, according to my group’s guide, nothing special. But Maya Sherpa is not just any guide: she is the first Nepali woman to have summited Everest twice (from both the north and south faces) as well as K2, the world’s second-highest peak. She is currently preparing to summit Kanchenjunga in eastern Nepal, number three. When I asked Maya the name of the pointed, imposing peak that greets travellers’ arrival in Lukla, she shrugged. “I don’t know, it’s just a hill. You won’t see big mountains until tomorrow.” Maya was not impressed easily, and I knew the walk ahead would not be ordinary. We had been warned that day two would be the most challenging, as it required a steep, three-hour ascent of over 500 metres. I was nervous, because as well as Maya, my group included an ex-competitive cyclist, a trail runner and several outdoor adventure enthusiasts. But my daily training of barre and spin classes had toughened up my legs: my thighs are sturdy not slender, they are strong and do what I need them to do. By following the Nepali guides’ advice—bistarai, bistarai; slowly, slowly—I kept up. No good can come from rushing up a mountain. It takes time to ensure steady footing on the dusty, rock-strewn trails, to fill the lungs with the thinning oxygen, to stop for the views. To appreciate that no cars reach these narrow paths, that it is foot power alone that connects these mountain communities. We stopped overnight at Namche Bazaar, an old centre of Sherpa culture, but now home to only around 100 permanent residents and over 50 trekking lodges. The Sherpa people of the Khumbhu district are closely related to Tibetans, and many of the crafts sold in Namche’s bazaars are unique to the region. Some are brought overland from Tibet. Tibetans and Nepalis have been crossing the high passes for centuries, but borders drawn through mountains now make it a treacherous night-time journey. Namche, sitting at 3445 metres, is a necessary stop for acclimatisation to the high altitude. Even in peak trekking season, when skies are mostly clear, the clouds roll in by afternoon and hide the imposing peaks that Namche is huddled between. Day three brought the mountain views that Maya promised. The peaks look like a child’s drawing of a mountain: pointed, capped in snow, framed by a bright blue sky and round yellow sun. Our feet led us high above Namche, to 3700 metres. Every breath and uphill step was now more of a struggle. It was all worth it to encounter a full-frontal Ama Dablam, often said to be the world’s most beautiful mountain—or at least in the top ten, rivalling Fuji or the Matterhorn in distinctive, near-symmetrical profile. Once out of Namche, we entered the UNESCO-listed Sagarmatha National Park. As well as the mountains, the wildlife here is an attraction. A flash of bronze, purple and turquoise was Nepal’s national bird, a danphe, or a species of pheasant. The sombre connotations of the English word, however, don’t reveal the peacock-esque splendour of the danphe. They appeared again and again, scurrying chicken-like through the brush or perched high on a branch. The dzopa turned into full-blooded yaks and naks. Another common misconception is that a yak can be male or female. In Nepali, yaks are male and naks female. ‘Yak cheese’ is a common item on the menus of trekking lodges, but Nepalis shake their heads and giggle at the thought. We expected cloudy afternoons and clear mornings, so weren’t concerned by the lack of visibility when we walked into Tashinga late in the day. Tashinga is not even a village, it is a small patch of flat land with one lodge and some vegetable fields overlooking the Dudh Koshi River canyon. On day four, I was not woken at sunrise by fierce light coming in my window. The light was a dull white, and I drew the curtains to snow. We walked in the snow, the fat flakes dampening down the dust that had covered us from the feet up on the previous days. With the evergreen fir-tree branches bowing under the weight of the new snow, and dzopas trundling past to the clang of the hand-made bells around their necks, the uphill trek to Tengboche felt like a classic Christmas scene. 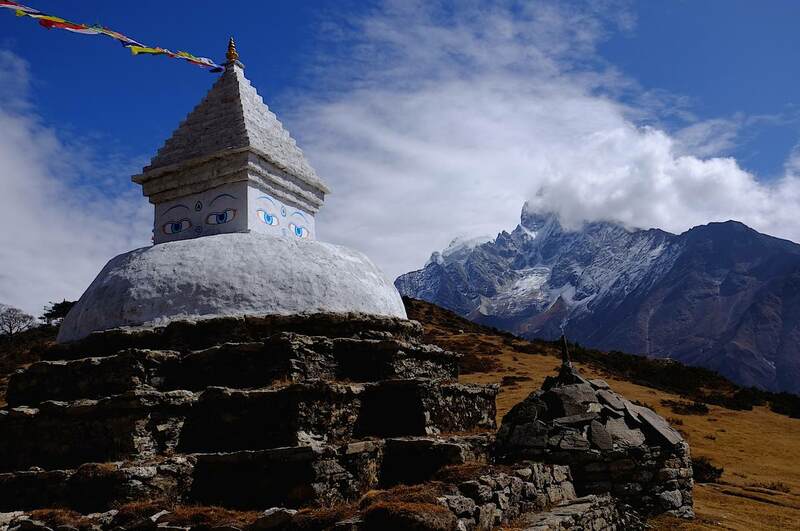 In Tengboche we visited the monastery, a traditional stop for trekkers proceeding to Everest. Our guides had gotten a bundle of red, blue, yellow and green prayer flags blessed by the aged head lama of Tengboche, clad in his traditional maroon robes and a matching down puffer jacket, sitting beneath a flowered duvet. Walking was hot work, but as soon as we stopped, the sweat that coated bodies and soaked through shirts became chilling. We arrived at our next overnight stop, Pangboche, just before the snow clouds reduced visibility to nothing. We huddled around the stove shivering, and laughing at the steam rising from our skin and clothes, not snow but sweat. We drank copious amounts of masala chia and prepared to retire beneath the thick woollen blankets, when we were told by the lodge staff to go outside. The clouds had cleared, and rising behind Ama Dablam was the almost-full, waning moon. There was excitement as we awoke on day five to blue skies, the sun-lit setting moon, and five, six, seven-thousand metre peaks on all sides. There was little definition between the permanent snow line of the high peaks and the sparer sprinkling of icing-sugar snow at town level. The good cheer waned as the clouds rolled in from down the valley, and the mountains were socked in once again. We were meant to be helicoptering out, but this wouldn’t be possible if the clouds hung around. If we could continue to rely on our foot power, which had brought us thus far, we might not have felt so disappointed. We had spent four days breathing, trudging, sweating, laughing our way up the mountains. We knew our legs could carry us, but modern transportation was letting us down. Nothing happens in a hurry in Nepal, but neither should it. Trekkers must bend to the immensity of the world’s highest mountains, take their time in them. We waited out the bad weather with more milky, spiced chia. The clouds cleared soon enough, and we were flown back to Lukla. Twenty minutes to take us the distance that we had strained and persevered for four days to walk. It felt like cheating, and I caught the smirk of contempt on the helicopter pilot’s face when I told him we had not walked all the way to base camp. Next time, I thought. There is always a next time with Nepal. I caught sight of the prayer flags that we had strung along a rocky outcrop. Perhaps the lama and those flags really had blessed our trip and allowed the weather to be on our side in the end. But the trip had felt charmed long before that. The power of the mountains had joined with the power of my feet. Nepalis have known about this power for centuries, and continue to welcome the trudging, panting, laughing trekkers passing through. Nepal has not been destroyed; it has just taken a few knocks. While the trails and trekking lodges have been quiet this year, they are most definitely open and ready for business.